Information failure is a type of market failure where individuals or firms have a lack of information about economic decisions. 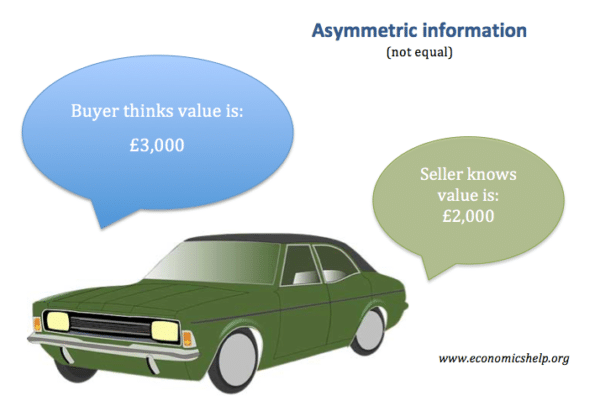 Information asymmetries – where one party has access to information that another party doesn’t. For example, the seller of a car may know it has some problem, but the buyer may not be aware. Difficulty in estimating costs and benefits. It is often difficult to be aware of social costs of goods. Accounting costs are relatively easy to know. But, when it comes to knowing more intangible external costs, it becomes difficult to put an accurate figure. For example, if we take producing energy from coal powered station, the private costs to the firm can be measured in terms of labour costs, costs of coal. But, the external costs from releasing CO2 into the atmosphere are very difficult to accurately measure. It requires estimates of the monetary cost of pollution both now and in the future. It is also very difficult to known future costs and benefits because there are many uncertainties – e.g. what will be the real economic cost of global warming. The harmful effects of sugar on health. Framing issues. When making decisions over whether to purchase a good, consumers will be influenced by how the good is portrayed. For example, a firm may advertise an orange drink has a healthy fruit drink, with added vitamin C. From the packaging a quick glance may give consumers the impression they are buying a healthy drink. But, hidden in the ingredients are very high levels of processed sugar. Drinks companies may even hide levels of sugar, by calling the sugar ‘dextrose’ or ‘glucose’. Therefore, the perception can be different to the reality. Moral Hazard. This occurs when individuals alter their behaviour because of certain guarantees. For example, an insurance firm may be willing to offer insurance against a bike being stolen. However, the firm may not realise that through offering insurance, it alters consumer behaviour and, after gaining insurance, the consumer takes less care to lock it up. Therefore, the insurance company loses out because it is more likely to pay out than previously expected. The government may offer a guarantee of bank deposits, but this could cause the bank to take more risks and increase likelihood government has to bail out banks. Irrelevant information / misinformation. If you are applying for a job, a firm may search on the internet and find a Facebook post from several years ago. The employer may use this and avoid giving job – even though it is no longer relevant to who you are now. Alternatively, there may be false information/slander circulated which is hard to deny. Information bias. The government has set up regulators to deal with natural monopolies, e.g. gas and electricity. The regulator aims to set fair prices for industry and consumers. However, if they rely on information from the firm, they may become sympathetic to the firm and allow price rises. This is known as regulatory capture – where regulators act in a favourable way to the firm they are regulating. Are we aware of the full benefit of studying and passing exams for lifetime income and opportunities? Are we aware of the health costs of a full fat yoghurt – with high sugar content? If we are employing people, how do we know how they will perform in their job? Confirmation bias. Do we look for information/opinions which backs up our preconceived ideas.